Scuba Diving Knife – The Scuba Diving Knife is rather a hot topic, with there being so many different types on the market, which one is right for you to choose. Do you really need a scuba diving knife at all? One must really look at what kind of diving is it that they love to do. I must be honest, after years of teaching Scuba Diving, I have never ever felt the necessity to un-holster my dive knife at all. Apart from when I see certain divers trample all over the corals, with their big floppy fins, smashing everything up in sight and oblivious to the damage they are causing. That’s another story and another article. Apart from that not really, simple guiding in clear, warm seas, then there is probably not too much call for a dive knife. On the other hand though; if technical diving is your thing, like deep diving, on wrecks, caves and other stuff like that where a dive tool would come in handy; then yes is the answer. If you are not sure if you need a dive knife then buy one anyway. At the end of the day, they do come in handy, if only for opening a beer after the dive. Once you have decided what scuba diving you like best, then the list for knives will shorten for you. Obviously you do not need a 30 cm knife if you are going to be teaching scuba in your local swimming pool at the weekends. Size of the knife depends on what you are doing. Of course massive knifes not only look threatening, they are dangerous too, so please be careful; they can also look ridiculous. A knife is a tool for helping you in case you or your buddy gets tangled up, or other similar reasons like that. Hopefully, you will never have to use it at all. Best to think what else you may need the dive knife for. If you purchase one with a very small blade, it is best to make sure it has a decent size handle on it, so you can hold it efficiently. Another factor to consider is the shape of the scuba diving knife. The point of the dive blade can be blunt, in fact more times than not these is the blade blunt. This is a safer way to use a knife, as it cannot be accidentally insert into something soft like flesh, Bcd’s, wetsuits or hoses. I would also recommend that the edge of the blade be serrated. 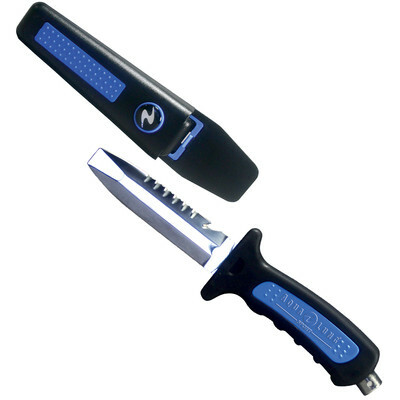 A serrated edged knife will suffice for most recreational diving occurrences, these edges can cut through very tough materials and they also tend to stay sharp longer. It is possible to find diving knives with both serrated and sharp edges on them. This is of course is the best of both worlds, though you may pay more for one of these scuba knives. Most dive knifes are made from stainless steel or titanium, most normal metals won’t last more than a few dives before they corrode into an orange rust. Stainless steel knives usually come in 300 series or 400 series of alloys. The lower the number the more difficult it is to keep sharp. All stainless steel knives will corrode eventually, some quicker than others. It is important to clean the knife when you have finished diving for the day. Also another good idea is to cover the blade in a film of vaseline, oil or silicone. If you are feeling flush, then go for a titanium knife they are the high end of the market scuba gear. Being rather more expensive than the stainless steel counterparts, they are also much lighter and won’t corrode so easily, as they contain no carbon so they don’t rust. The titanium blades also hold their sharpness for a long time so no need to sharpen them either. Attaching the knife to your leg like Cousteau and his friends did way back when, will only raise sniggers and fun poking at your attire. The best place for you knife is attached to your BCD directly. Not on the shoulder near the neck, not on the inflator hose as it is easy to again stab yourself. Many new Bcd s have an attachment area for your blade near the pocket, here it is safe out of the way and very easy to reach when you may need it.